Nancy Tobin, far right, walked ahead of national advocacy groups made up of parents who have lost a child to opioid overdose as they marched outside of the Arthur M Sackler Museum in Cambridge. CAMBRIDGE — Parents who lost children to the opioid epidemic rallied and demanded Friday that the late Arthur M. Sackler’s name be removed from a Harvard University museum, saying his family’s involvement in the crisis should disallow any benefit from an association with the arts. Parents and supporters marched in front of the Arthur M. Sackler Museum early Friday afternoon, holding photos of their children. “Sacklers lie, our children die, take down their name!” they chanted. Mindy Guerrini, whose daughter died in January of an opioid overdose, said the name change was important so the family did not benefit from a connection with the distinguished institution. Sackler, who died in 1987, was targeted by the parents because of his family’s ownership of Purdue Pharma, the company that marketed opioids like OxyContin to doctors and patients and is charged with misleading the public about the drugs’ addictive effects. More than 1,000 lawsuits have been filed against dozens of opioid companies and the Sackler family according to media reports. Opioids, including illicit drugs such as heroin and fentanyl, were involved in a record 48,000 deaths in 2017, according to the US Centers for Disease Control and Prevention. Cheryl Juaire and Rhonda Lotti organized Friday’s protest through Team Sharing Inc., a support group they founded for parents whose children died of drug overdoses. 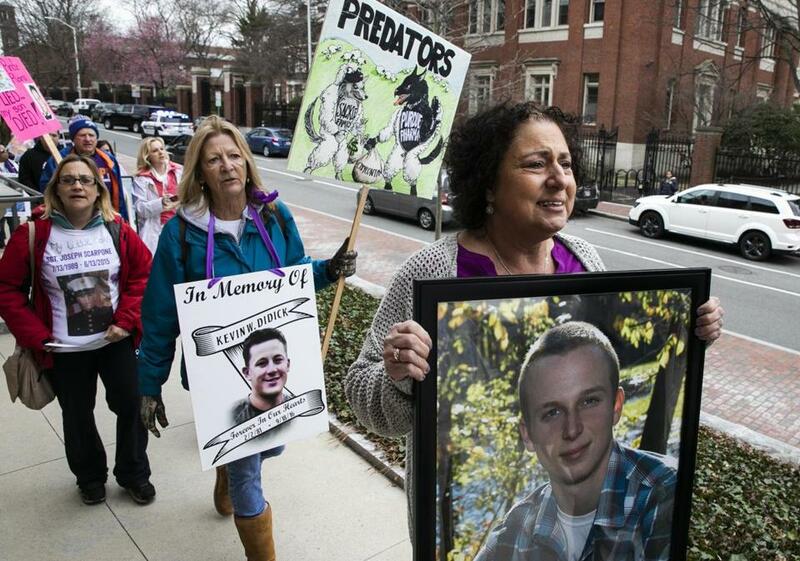 Juaire’s son and Lotti’s daughter both died after overdosing on opioids in 2011. National advocacy groups marched outside of the Arthur M Sackler Museum. Harvard University said in a statement that the Arthur M. Sackler Foundation does not fund the Arthur M. Sackler Museum and that Sackler died before OxyContin was developed. 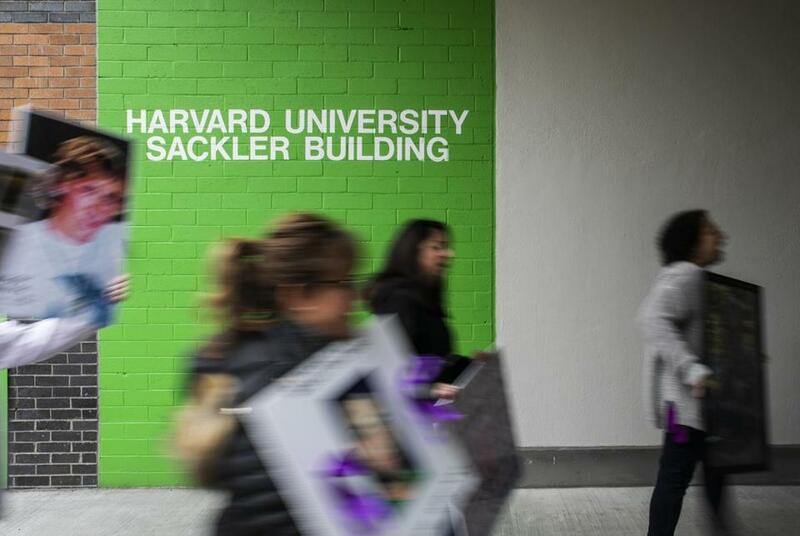 “Given these circumstances and legal and contractual considerations, Harvard does not have plans to remove Dr. Sackler’s name from the Museum,” Harvard officials said in the statement. Sackler had donated funds for the construction of the original museum building on Broadway before it was moved to Quincy Street in 2014, the statement said. Sackler’s widow, Jillian Sackler, who is president of the Dame Jillian and Dr. Arthur M. Sackler Foundation for the Arts, Sciences and Humanities, defended her late husband in an opinion article in The Washington Post Thursday. Many parents argued Arthur Sackler taught his brothers and his nephew, Richard Sackler, effective marketing strategies that enabled the success of Purdue Pharma. To them, it doesn’t matter that Arthur Sackler wasn’t alive when OxyContin was developed and introduced. “It’s no difference. The Sackler family set up Richard,” said Tony Lagreca, a Duxbury resident whose son Matthew died in 2014 at age 41. Other museums have taken a stand and Harvard should follow, Juaire said. The Tate Museum in Britain and the Guggenheim Museum in New York both said they’d stop accepting gifts from the family. Tufts University is considering following suit according to school officials. 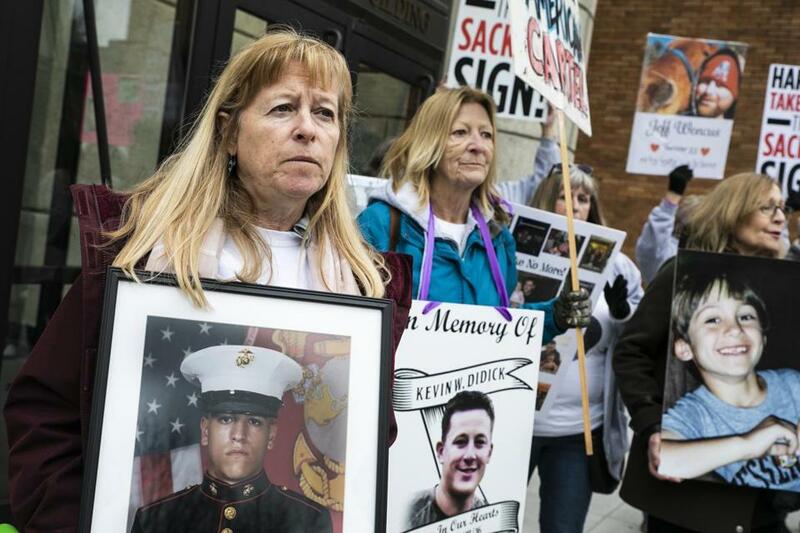 Kathleen Scarpone held a photo of her son, Sergeant Joseph Scarpone, during a demonstration outside of the Arthur M Sackler Museum. Friday’s rally wasn’t the first protest targeting the Harvard museum over the issue of opioids. Famed photographer Nan Goldin — who has depictions of drug use among her works — led a rally last July urging Harvard’s art museums to cut ties with the Sackler family. On Friday, the protesters called for more awareness regarding prescribed opiates because many parents don’t understand how dangerous the medicine can be. LaGreca said his son became addicted to opioids after being prescribed OxyContin for an injury he suffered while playing football at Curry College in Milton. “[My kid] didn’t get drugs from Mexico, he got them from CVS [Pharmacy],” LaGreca said. Guerrini said her daughter was prescribed opioids at age 15 after her wisdom teeth were removed. Kailey quickly became addicted. She was 15 months sober before she relapsed this winter and overdosed at age 27. In addition to increased awareness, Guerrini wants more funding for treatment. “I had no idea that she was predisposed to addiction and it would end up killing her, otherwise I never would’ve agreed to it,” Guerrini said. Recently, in response to a lawsuit filed against the company, Purdue Pharma agreed to pay $270 million to the state of Oklahoma for addiction research. The Sackler family agreed to pay $75 million as well, though they were not listed as defendants in the case.